Orthodontic treatment involves the management of tooth movement, but at McKenzie Orthodontics, Dr. Angela Sharma also treats Dentofacial Orthopedics, which involves the guidance of facial growth and facial development. Facial growth and development mainly occurs during childhood, making children ideal candidates for Dentofacial Orthopedics. Dr. Sharma evaluates and monitors your child’s growth in order to determine the best time to begin treatment. 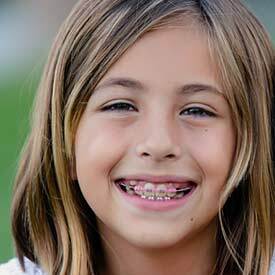 Two Phase Treatment is a specialized orthodontic process that involves two phases of treatment — with the first phase beginning when your child still has remaining primary (baby) teeth, and the adult teeth are beginning to erupt into the mouth. Phase two treatment begins once all of the adult teeth have erupted into the mouth. The goal of two phase treatment is to act as an intervention, to prevent future complications and invasive treatment down the road. During this phase, Dr. Angela Sharma uses treatments designed to correct jaw growth to ensure the jaw bone is aligned correctly, before beginning the next phase of treatment, which typically involves braces to then straighten the teeth. Dentofacial Orthopedics may also be used to treat adult patients. Most adults that require Dentofacial Orthopedics require orthodontic surgery. For children, the jaw bones are still forming, which makes it much easier for Dr. Sharma to control bone growth and tooth movement. For adults, the bones have stopped growing and has hardened, making it more difficult to correct the bite and to move the jaw into proper position. Surgery is often recommended to manipulate the jaw bone to establish adequate bite alignment before proceeding with treatment. To learn more about Dentofacial Orthopedics, please contact McKenzie Orthodontics to schedule your consultation with Dr. Angela Sharma.